The verdict in State of Florida v. George Zimmerman is giving us a critical opportunity to talk about what racism looks like in today’s America. Racism can be an uncomfortable thing for people to talk about. I find it hard. Even though I try to remain practiced at it, because I think it’s the way to help create positive policy change, I still think it’s hard to do. Ironically, I think it’s hard to talk about racism because we have broad agreement that it’s wrong. Conventional wisdom holds that treating or thinking less well of someone on account of their race is a bad thing. In the social sciences, we say that avoiding being racist is a social norm. The fact that anti-racism is a widespread social norm is very important for keeping down the incidence of overt racism. It didn’t used to be this way. Thankfully, because of the personal sacrifice and dedication of hundreds of thousands of people who worked to overturn the legal status of overt racism, we have a country that is better than it used to be. Just because we are better than we used to be, however, doesn’t mean that racism is gone. The evidence of this is present wherever you look. Having a name that sounds “white” means your resume is 50% more likely to get you called for a job interview than if your name sounds “black,” with an identical resume. Researchers have demonstrated that both experimental subjects and actual hospital personnel implicitly believe that black people feel physical pain less than white people do. Racial profiling is a well-documented— and heavily defended — reality which means that your skin color determines whether police see you as a person or a problem. Here is another way of looking at some of the data I presented in the chart at the top of this post. This is what the outcome of a racist society looks like. 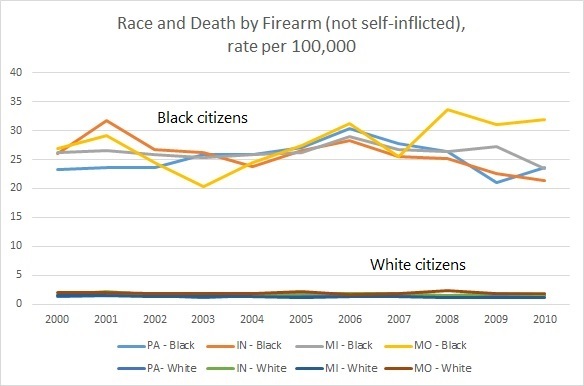 If you are black, you are much more likely to be killed by someone shooting you. This outcome is highly suggestive of a huge average racial disparity in political, economic and legal power. When we see an injustice, what we want to know first is: who’s fault is it? Who can I blame? Or, who’s fault is it, so they can fix it? The thing about a big structural problem like racism is that it is very entrenched and very difficult to change. Collective beliefs about race are old and received substantial legal and political support for centuries. Societies are made up of lots and lots of people, and changing old collective beliefs means changing lots and lots of mental constructs. Doing all of that work is somewhat harder when nobody really wants to believe that they’re racist. (Want to know if you are? If you’re interested, you can check using the Implicit Association Test.) Moreover, since the social norm of anti-racism is entrenched, it’s very hard to “come out” as racist. Nobody wants to think about themselves as a racist – it means you’re a bad person. That’s what the social norm against racism means. Since people are generally pretty interested in maintaining positive self-regard, it is hard for people to adopt a label that makes them feel bad about themselves. But without naming it, how can we begin to fix the problem? Another psychological phenomenon that interferes with the work of social change is the just world hypothesis. This describes the way people can re-interpret a distressing situation by blaming the victim in order to subconsciously cause themselves less distress. When experimental subjects witness someone in pain and they are are able to lessen that pain, they value that person more than someone whom they are unable to help. Large social problems can feel insurmountable from the individual’s perspective, making it more likely that we will look for reasons to blame victims and lessen our psychic discomfort with the pervasive injustice. We don’t want to identify ourselves with “bad people” and so avoid acknowledging the ways we subconsciously contribute to the larger problem. It is hard to talk about racism. But because we want to get better as a society, because we want to live in a country where the color of your skin doesn’t determine whether you get the job, get the pain medication, are sent to jail, or are more likely to get shot, we have to keep bringing these uncomfortable truths out into the light.